This was inspired by a Pip & Ebby post, which I adapted for a Presidential debate snack. The recipe below is more closely aligned with their original recipe. If you want to make it extra special, mix in some canned pumpkin (about a 1/4 cup) and some cinnamon sugar to the cream cheese. Just let the cream cheese come to room temperature before trying to blend the extras in! Because of the cream cheese, any leftovers should be covered and refrigerated. Preheat your oven to 350 degrees F. Spray a 12-cup bundt pan with cooking spray and set aside. 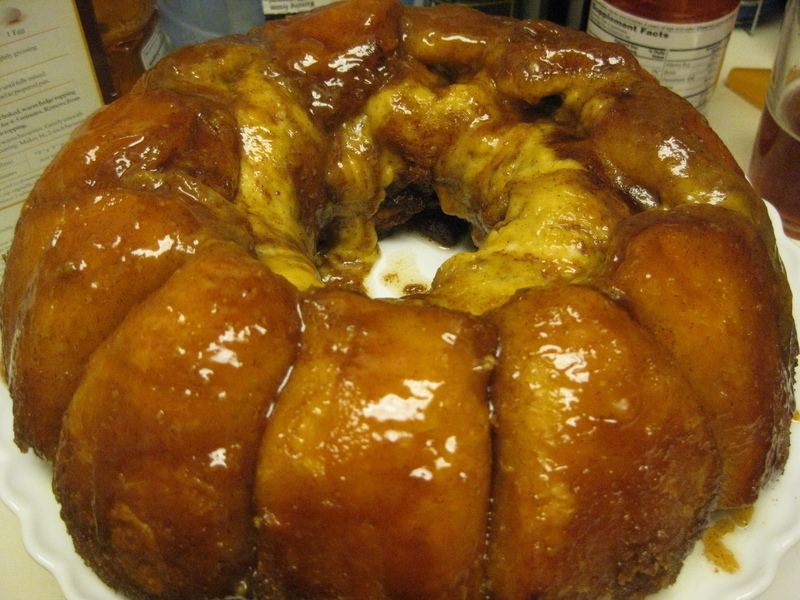 In a medium bowl, combine the brown sugar and granulated sugar with the cinnamon. Set aside. Melt butter in a small bowl in the microwave. Set aside. Set your biscuit discs on a flat surface and place one cube of cream cheese into the center of each piece of dough. Wrap the edges of the dough up and around each cube of cream cheese as much as you can. Place 10 of the dough-wrapped cream cheese cubes, cheese-side-up, into the bottom of the prepared pan. Top with half of the sugar-cinnamon mixture and half of the melted butter. 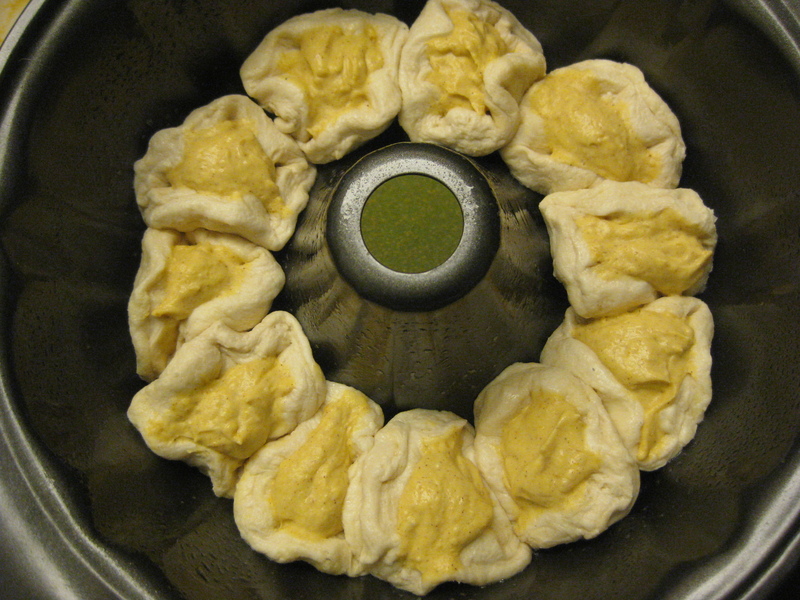 Top with the remaining dough-wrapped cream cheese cubes, cheese-side-down, and the remaining sugar mixture and butter. Bake in the preheated oven for 40 minutes. Invert onto a serving platter and serve warm! I made this cake while sitting at home today waiting for Hurricane Sandy. It is one of the simplest cakes to put together since you mix it in the pan you bake it in – plus it is dairy and egg free. The cake will keep on the counter for about 3 days…just long enough to evade most power outages! Preheat your oven to 350 degrees. Lightly grease an 8-inch square pan. 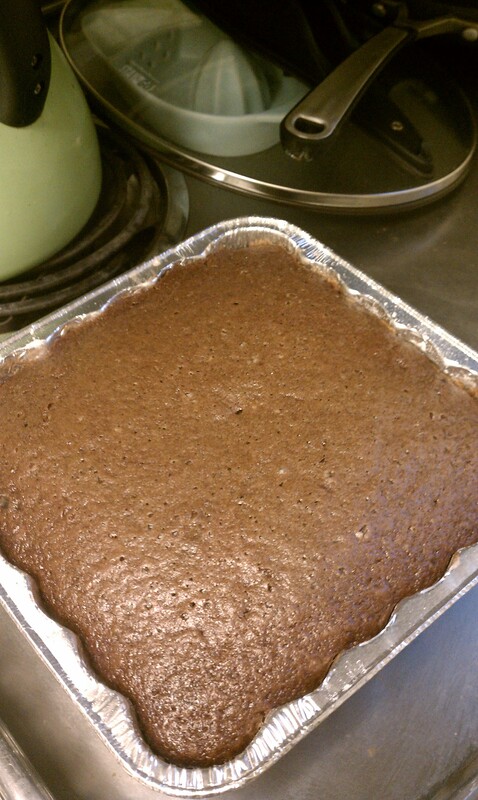 Sift the flour, cocoa, baking soda, salt and cinnamon directly into the baking pan. Then mix in the sugar. With your finger, poke 2 small holes and 1 large one in the dry ingredients. Into one of the small holes pour the vanilla, into the other one the vinegar, and into the larger one the oil. Pour the water over all the ingredients and stir the ingredients together with a table fork, reaching into the corners, until you can’t see any more flour and the batter looks fairly well mixed. Bake for 35 to 40 minutes, or until the top is springy and a tester inserted in the center comes out dry. Cool the cake in the pan on a wire rack, then cut and serve it from the pan. This is simple soup that is made awesome by the addition of curry. Plus my friends agreed: “adding carrots makes it extra tasty so it really feels like a meal.” It uses two types: red curry paste and yellow curry powder. If you can’t find the paste, just substitute more yellow curry to taste! Heat oil over medium heat in a medium-size stockpot. Add onion and a pinch of salt. Stir until onions are translucent, about 5 minutes. Add the garlic, carrots, and celery, and cook an additional 3 to 5 minutes. Add the tomatoes with their juices and bring to a boil. Add curry paste, 1 t curry powder, cumin, and chicken stock. Cover partially and reduce heat to medium-low. Simmer, stirring occasionally, for about 20 minutes. Salt and pepper to taste. Add additional curry powder to taste. I don’t remember where I found the recipe that I adapted into these cupcakes, but I do remember why I was drawn to it: the surprise addition of balsamic vinegar to the batter! You may be asking…vinegar? Why is there vinegar in cupcake batter? This recipe uses baking soda to help the cupcakes rise, which means you need some sort of acid to activate the baking soda’s chemical genius. You could use lemon juice or buttermilk, but the combination of sweet balsamic and chocolate make this treat extra special. I also like that these cupcakes are relatively not sweet. Hope you like them too! Position the oven racks in the lower and upper thirds of the oven. Preheat the oven to 350 degrees. Line two 12-cup muffin pans with paper liners. (I used one 12-muffin regular pan and one 24-mini muffin pan). Either in a small food processor or a small with an electric mixer, beat together the egg, 1/2 cup of the sugar and cream cheese on medium speed until smooth. Prop up a pastry (or ziplock) bag in a sturdy glass or mug with the bag’s wide opening at the top. Fold the top of the pastry bag down over the glass. Using a rubber spatula, scrape the filling mixture into the pastry bag. Set the filled pastry bag aside. You could also use a squeeze bottle with a narrow/pointy top here. In a medium bowl, combine the water, oil, applesauce, vanilla and balsamic vinegar. Give them a quick stir and set aside. In a large bowl, whisk together the flour, cocoa powder, baking soda, sugar and salt until evenly blended. Slowly pour the water mixture into the flour mixture, stirring with a wooden spoon until the batter is smooth. The cupcake batter will be quite runny. If your bowl has a spout, you can pour the batter directly into the muffin cups. Otherwise, it will be easiest to pour the batter into the liquid measuring cup and use it to fill the cups. Fill each lined muffin cup three-fourths full. Do not fill them any fuller than that or there will not be anywhere for the filling to go when the batter rises! Pick up the pastry bag. Plugging the tip with one hand, twist the top of the bag to close it. If using a ziplock, carefully snip off one of the bottom corners to create an opening. Using one hand to guide the tip and the other to squeeze the top of the bag, insert the tip into the center of one of the cupcakes. Gently squeeze a small amount of the cream cheese filling into the batter. You will see the chocolate batter rise as the filling fills the middle. Keeping in mind that you need to fill 24 cupcakes, squeeze a small amount into each one. Sprinkle the top of each cupcake with the chocolate chips. Put the muffin pans in the oven and bake until a thin skewer inserted into the center of a cupcake comes out clean, 26 to 28 minutes. Remove the pans from the oven and put them on cooling racks. 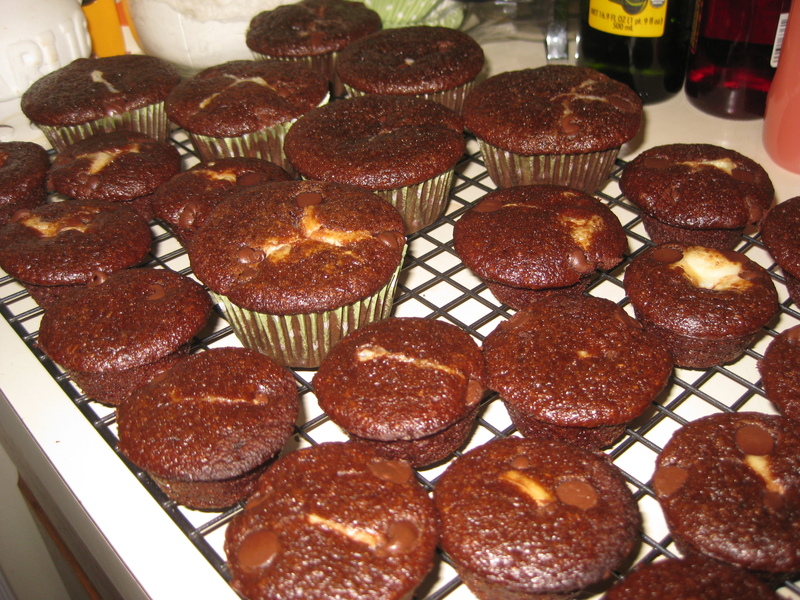 Let the cupcakes cool in the pans for 20 minutes, then lift out the cupcakes and put them directly on the racks. Let cool completely, about 30 minutes. The fall is a great time of year for slow cooking with a crock pot. There is some amazing about coming home after being at work or out all day to a home that is full a ready-to-eat dinner. I found this recipe on Eat Live Run and made it the very same day. 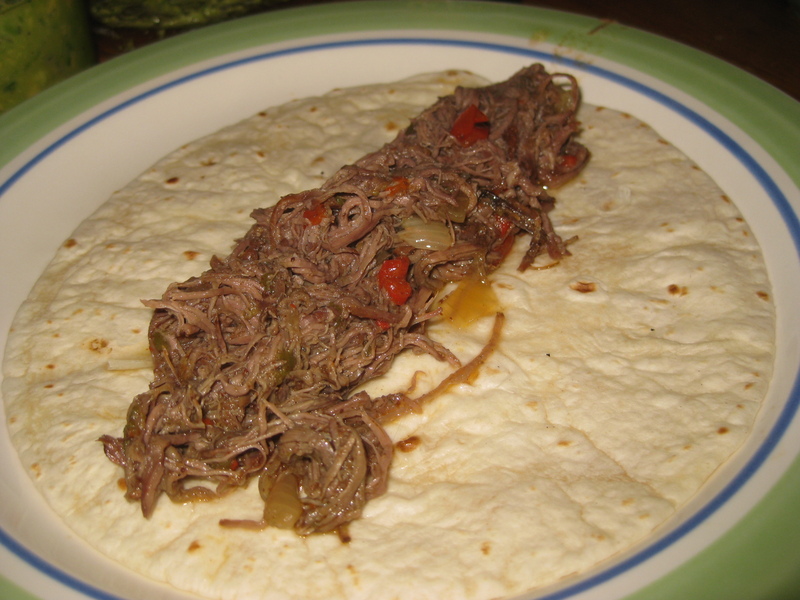 The cool thing about carnitas (aka steak tacos) is that the meat becomes very versatile. You can use it in tacos or to make nachos or inside a sandwich or on top of a southwestern salad. Try and let me know your favorite way to dress it up! Mix together all spices in a small bowl. Rub the spices all over your flank steak—be generous here! Then, place your steak at the bottom of your crock pot. Cover the steak with the chopped onions, bell peppers and jalapeno pepper. Turn heat on LOW and cook for 8 hours. After 8 hours, remove meat from crock pot and shred with a fork. It should be incredibly easy to shred. You can either stick the shredded meat back in the pot for another hour or serve as is. To serve, heat your corn tortillas in a skillet on the stove. Spoon some carnitas on a tortilla then top with salsa, avocado, and a squeeze of lime. Enjoy with a margarita for best result. Momm found this recipe in her archives from her mother. It’s tasty sweet and freezes well. Not sure why it is “colonial” but I like it anyways. 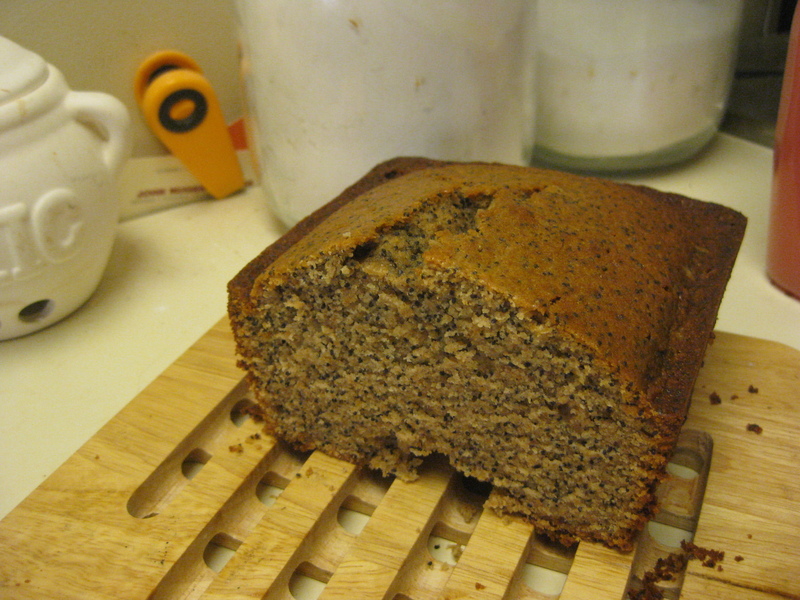 If you decide to make it, note that you will need about 3 hours of lead time to soak the poppyseeds. 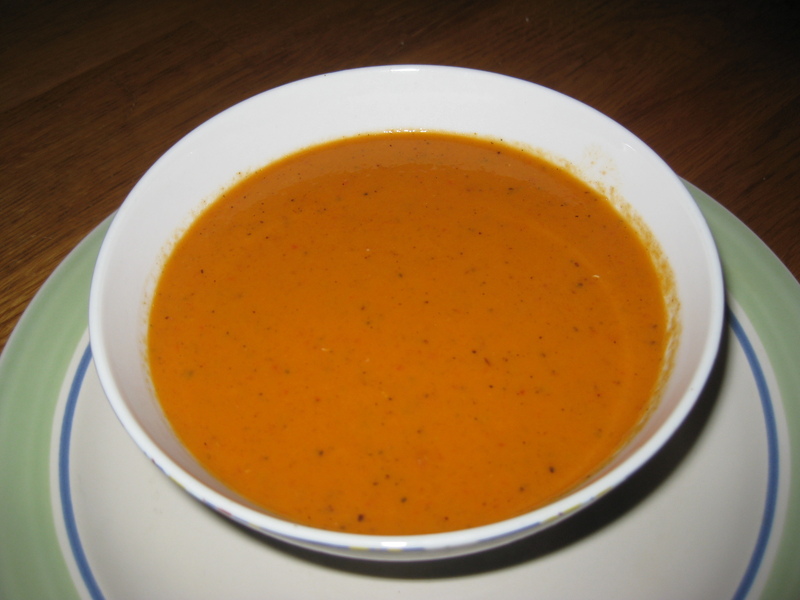 Combine poppy seeds and milk in a large bowl. Let stand at room temperature for 3 hours. Let butter and eggs warm to room temperature for easy mixing. Grease and flour an 8 1/2″ bread pan. In a medium mixing bowl, cream together the butter and sugar. Add eggs, vanilla, baking powder, and flour, as well as the poppy seeds and milk. Mix well. Pour into prepared pan. Bake for 1 hr 15 min or until center springs back when lightly pressed with fingertip. Cool in pan on wire rack 10 minutes. Loosen around edges and turn out to cool the rest of the way. This is a variation on a recipe that Smitten Kitchen adapted from Bon Appetit. 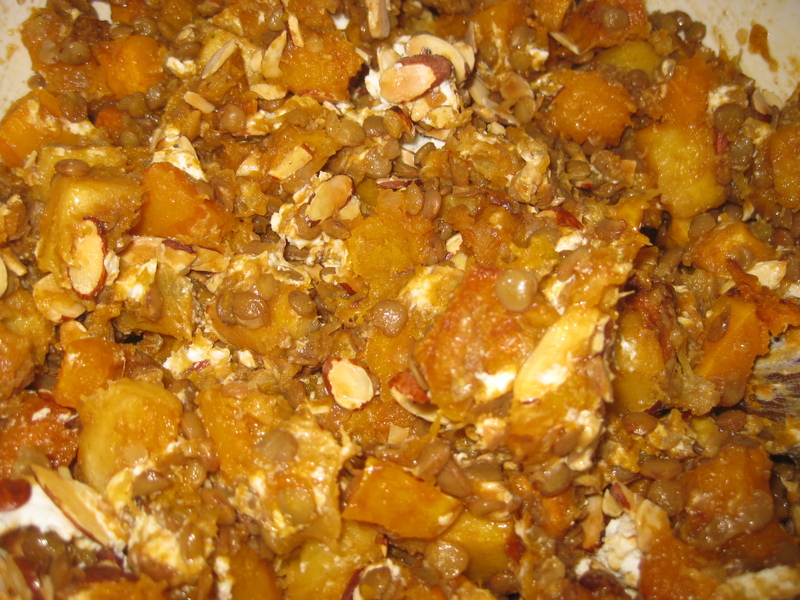 It is a great fall recipe with lentils and roasted squashes. The goat cheese makes it a little tangy and creamy, and then the nuts add some crunch. I like this particular dish served at room temperature or slightly warm, but how you serve it is up to you! It is also substantive enough to be an entree or a great side. Preheat oven to 400 degrees. Line a baking sheet with edges with tinfoil. In a large mixing bowl, toss squash cubes with 2 tablespoons oil, cumin, paprika and salt. Arrange in a single layer on baking sheet and roast 20 minutes. Flip pieces and roast for an additional 10 to 15 minutes, until tender. Cool. Meanwhile, soak lentils for 10 minutes in a small bowl, then drain. Cook lentils in boiling salted water until tender but firm, about 30 minutes. Rinse with cold water, then drain and cool. Combine squash, lentils, arugula (if using), and the goat cheese. Whisk together the Dijon, remaining 2 tablespoons of olive oil and two vinegars in a small bowl. Season with salt and pepper and extra vinegar/oil, if desired. Toss the salad with the dressing and almonds and enjoy! You are currently browsing the Muffin Bites blog archives for October, 2012.